skybow Forms: Dynamic Field Validation. Building a business solution with the out-of-the-box functionalities is challenging. Dynamic data input masks are often an important criterion for user acceptance and the success of a project. We are aware of this problem and solve it by providing a way to dynamically optimize forms for the user, without the need for InfoPath or complicated iQuery. skybow called this solution “Dynamic Forms” and. It was able to set fields dynamically in dependence of another field as hide, disable, or mandatory. The “Dynamic Field Validation” adds another possibility to those previous options. Now, one might wonder why skybow releases specifically this extension. It is true that with SharePoint it is already possible to set a validation per field . An expert in SharePoint formulas knows that their possibilities are limited and cover only a small part of the requirements of a business solution form. 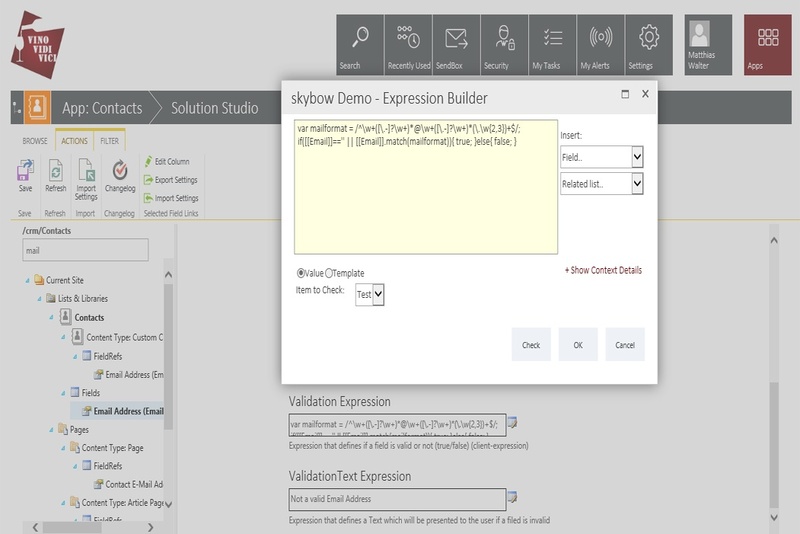 The option to use skybow Expression Language in the new Dynamic Field Validation offers a number of additional options. A good example of the utilization of our " Dynamic Field Validation " is a CRM. It is essential that the information entered is valid. One way skybow helps is to check whether the entered email address has been entered in the correct format. Dynamic Field validation can check whether a certain password fulfils the given guidelines, by for example containing at least one number, an uppercase and lowercase letter. This is the latest extension of the skybow SharePoint Forms. More information on further skybow solution accelerators are available www.skybow.com. If you have questions, contact me anytime.